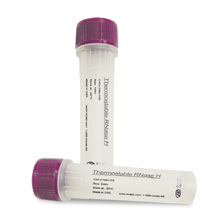 Thermostable RNase H has an optimal activity above 65°C and can be used up to 95°C. The enzyme degrades RNA in a DNA:RNA hybrid, maximizing sensitivity and selectivity without affecting DNA or unhybridized RNA. A recombinant protein purified from E. coli, cloned the gene encoding the Thermus thermophilus RNase H.
One unit of the enzyme results in the acid-solubilization of 1 nmol of polyadenylic acid in the presence of an equimolar concentration of polythymidylic acid in 20 minutes at 45°C in 50 mM Tris-HCl(pH 7.5), 100 mM NaCl, and 10 mM MgCl2. Note: The unit assay is performed at 45°C because this is optimal for the Tm of poly(dT):poly(A). The optimal temperature for many applications may be considerably higher. Supplied in 50% Glycerol containing 50 mM Tris-HCl (pH 7.5), 0.1 M NaCl, 1.0 mM DTT, 0.1 mM EDTA, and 0.1% Triton X-100.